Abstract: Imagery of western Peru from 2012, imagery of eastern Peru from 2010 and 2013. 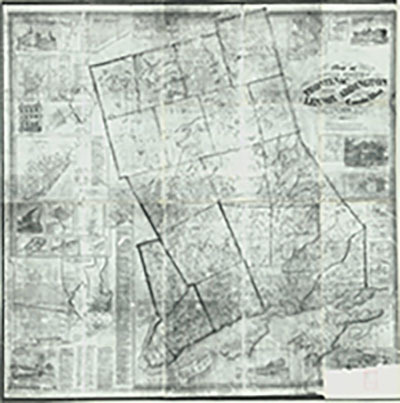 Abstract: Photostat reduced; original scale 400 Rods to 1"; survey grid; roads; names of landowners; bldgs. ; insets of 28 towns; pictures of bldgs. ; business directory. Creator: George Philip & Son Ltd.
Abstract: Place names with pop. key; counties & twps. 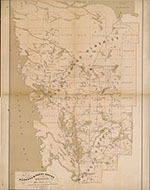 ; 13 classes of railways; national forests & parks; spot hts. in ft.; steamship routes; publication date likely between 1904 and 1911. Abstract: The city of St. John's -- The city of Mt. Pearl -- St. John's - centre for an ocean playground. Includes text, colour illustrations, and black-and-white photographs. Oriented with north to the upper right. Streets and points of interest indexed. Abstract: Soundings in fathoms; 20 insets of banks, anchorages, etc. ; key to lights & bottom characteristics; notes on fishing grounds; magnetic courses & distances; tidal info; 6 profiles; compass bearings; notes. Abstract: Streets named (& indexed on verso); built-up areas; relief by contours & spot hts. 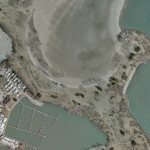 ; index to points of interest; vegetation detail; UTM grid. Abstract: Pictorial relief; place names. "Tirée de diverses Relations des Francois, Anglois, Hollandois, &c. Par N. Sanson de Abb'. Geogr' ordre du Roy." Abstract: Map part of Library and Archive Canada's archived map collection. LAC microfiche number 14881. 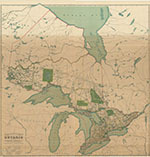 Abstract: Map showing districts of Muskoka and Parry Sound, Lake Nipissing in the North and as far as Georgian Bay. Abstract: "Rae Smith, engraver ... New York, U.S.A."--Lower margin. Colored by county. 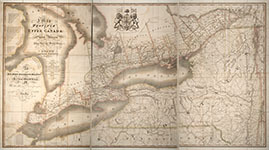 Includes Upper Canada (Ontario) and Lower Canada (Quebec). Includes circular inset map of the Northern Hemisphere. Includes text and tables: Catalogue of some of the minerals of Canada; Total exports of minerals during the years 1856-1858; Principle kinds of timber exported; Tabular list of counties in Upper Canada with the townships; Tabular list of counties in Lower Canada with the parishes; List of the various railway stations in the province and their respective distances. Shows railroads, common roads, canals, and colonization roads. Creator: Chewett, James G; Ridout, Thomas Esqr. Abstract: "James G. Chewett, Assistant Drafstman under the direction of Thomas Ridout Esqr. Surveyor General of the Province" "Engraved by I.S. Cox for the Canada Company." Relief by hachures. Shows canals; roads; portages; district, county and township boundaries. shows also most of New York State.